Make the 23rd (Mon) an awe-inspiring day at Chugach State Park. 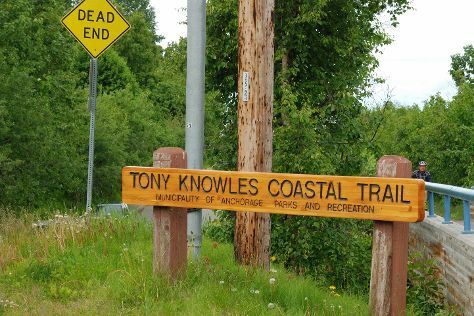 There's still lots to do: get to know the fascinating history of Tony Knowles Coastal Trail, deepen your understanding at Alaska Native Heritage Center, take in the spiritual surroundings of Holy Family Cathedral, and trek along Virgin Creek Falls Trail. To see traveler tips, other places to visit, and other tourist information, read our Anchorage travel route builder tool . Use the Route module to find travel options from your starting location to Anchorage. September in Anchorage sees daily highs of 57°F and lows of 44°F at night. Finish your sightseeing early on the 23rd (Mon) to allow enough time to travel to Niagara Falls. Niagara Falls is known for nature, casinos, zoos & aquariums, shopping, and trails. Your plan includes some of its best attractions: Head underground at Cave of the Winds, immerse yourself in nature at Whirlpool State Park, admire the sheer force of Niagara Falls, and take in the architecture and atmosphere at St. Mary of the Cataract R. C. Parish. For reviews, other places to visit, ratings, and tourist information, read Niagara Falls trip itinerary builder tool . Traveling by combination of car and flight from Anchorage to Niagara Falls takes 13 hours. Alternatively, you can do a combination of car, flight, and train. Traveling from Anchorage to Niagara Falls, you'll lose 4 hours due to the time zone difference. Prepare for a bit warmer weather when traveling from Anchorage in September: high temperatures in Niagara Falls hover around 75°F and lows are around 55°F. Cap off your sightseeing on the 26th (Thu) early enough to go by car to Buffalo. On the 27th (Fri), take in the waterfront at Bird Island Pier, then examine the collection at Buffalo Religious Arts Center, then admire the striking features of One M&T Plaza, and finally take in the spiritual surroundings of St Joseph's Cathedral. On your second day here, admire the landmark architecture of Frank Lloyd Wright's Darwin D. Martin House Complex, then get outside with Great Baehre Swamp, then take in the architecture and atmosphere at Saints Peter & Paul Church, and finally take in the spiritual surroundings of Our Lady of Victory Basilica. To find maps, other places to visit, traveler tips, and other tourist information, read our Buffalo trip itinerary builder site . Buffalo is just a stone's throw from Niagara Falls. In September, daytime highs in Buffalo are 74°F, while nighttime lows are 55°F. Cap off your sightseeing on the 28th (Sat) early enough to travel to New York City. New York City is known for museums, nightlife, shopping, historic sites, and parks. Your plan includes some of its best attractions: take in the pleasant sights at Central Park, appreciate the history behind Statue of Liberty National Monument, don't miss a visit to Empire State Building, and admire the striking features of Rockefeller Center. For maps, more things to do, traveler tips, and tourist information, use the New York City online vacation planner . You can fly from Buffalo to New York City in 4 hours. Other options are to do a combination of flight and bus; or drive. In September, New York City is somewhat warmer than Buffalo - with highs of 80°F and lows of 66°F. Wrap up your sightseeing on the 3rd (Thu) early enough to travel to Syracuse. Syracuse is a city in, and the county seat of, Onondaga County, New York, in the United States. Start off your visit on the 4th (Fri): grab your bike and head to Cranx Indoor and Outdoor Bike & Sports Park, sample the fine beverages at 1911 Spirits, and then admire the striking features of Clinton Square. Plan my day in Syracuse using traveler tips and tourist information provided by Inspirock. Traveling by flight from New York City to Syracuse takes 4.5 hours. Alternatively, you can do a combination of bus and flight; or drive. Plan for a bit cooler temperatures traveling from New York City in October, with highs in Syracuse at 63°F and lows at 45°F. Wrap up your sightseeing on the 4th (Fri) to allow time to travel back home.